This bacon cheeseburger has the bacon and cheese stuffed inside the patty. This little surprise makes a great-tasting burger. It's a perfect recipe for a quick weeknight meal, casual cookouts, and tailgating. You will want to choose beef that has sufficient fat so it will hold together well when stuffed. An 80/20 blend (20 percent) fat is good. Unfortunately, leaner ground beef will tend to fall apart and you'll have your delicious stuffing oozing out before you can enjoy the burger. Note that you need to cook your bacon before you add it to the stuffing. Otherwise, raw bacon inside a burger is still going to be raw when the burger is cooked. If you prefer cooked onion, you may saute your onion before adding it the mixture. Otherwise, it will be warmed but still have a raw flavor, which some people prefer. Combine the bacon, onion, and cheddar cheese in a medium bowl and set aside. Preheat the grill for medium-high heat. You can also prepare these on the stove top or oven. Mix the ground beef, spike seasoning (or seasoned salt), and beer. Separate the mixture into six equal portions. To shape the mixture into thin patties, place each between two sheets of waxed paper and onto a parchment-lined cutting board or baking sheet. Use a flat-bottomed plate to press each into a thin patty that is 1/4-inch thick and about 4 inches across. Form a rim at the edges of three of the patties. Place the bacon/onion/cheese mixture on three rimmed patties. Top these with remaining patties and press the edges together to seal them. Grill, broil or pan-fry the burgers until they are well done (internal temperature of 165 F), about 4 to 5 minutes per side. As these burgers will be rounder than usual, they will take longer to cook than unstuffed patties. Be sure to check the temperature. Once cooked through, remove the patties from the heat and place them onto toasted buns. Top the burgers with your favorite condiments and serve. 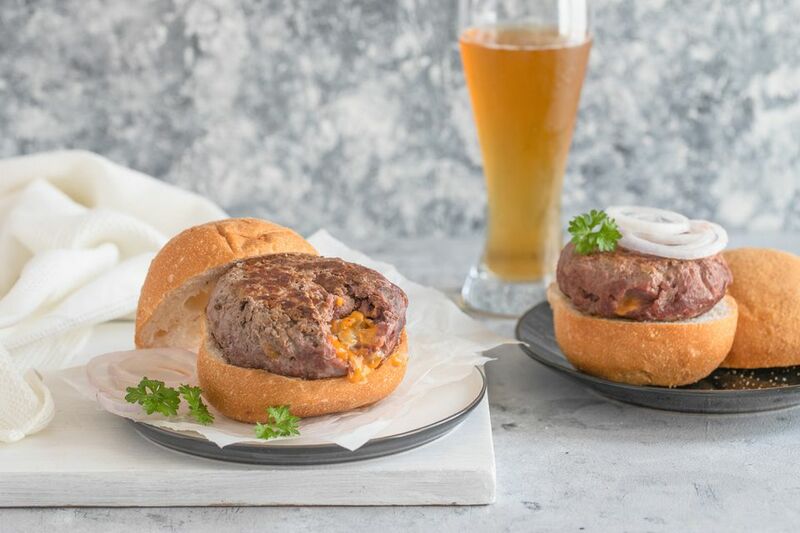 Stuffed burgers need a sturdier bun than unstuffed burgers—you might choose a brioche or kaiser roll rather than a soft bun. Also, you won't be cutting your burgers in half when serving as the stuffing would then ooze out. Always serve stuffed burgers with a warning. Lava-hot cheese jetting from your burger is not a pleasant surprise. It's best to wait a few minutes before you bite into one as the cheese stays dangerously hot for quite a while after leaving the grill. Have the boldest person at your table take a small bite to test whether it's safe. You are going to need a lot of napkins when serving your stuffed burgers as the stuffing can squirt out unexpectedly. Also, it's best to not wear your finest clothes while digging into this burger. The Grilled Herb Burgers Are Sure to Please!